A Singular Creation Art Community - View article - In MunnyWorld you can do anything you want! Board index Articles Articles In MunnyWorld you can do anything you want! In MunnyWorld you can do anything you want! Article Description: An introduction to Custom Munny Modification for artists. KidRobot has been a leader in the counterculture phenomenon of art and design called “Urban Vinyl” ever since 2002 with the introduction of their first toy simply named Mascot ‘Bot. That is the robotic figure with the Mohawk-like fin thingy down the center of its head on their site. Custom Munny-making is a playful (or serious) creative project for ages 5 and up and making its mark on the art scene. What is a Munny? It’s like an unfinished doll or rather a full-on armature for an artist or sculptor to work on. The only limit in MunnyWorld is the artist’s imagination. The official site for more info on the MunnyWorld brand and a gallery of customized Munnys showcasing an array of art types and styles is at this link. You might be wondering “Is this for kids, I mean the site says kid robot”… well actually many adults, one for example - artist Matt Groening, are creating their own versions from this series of dolls. It is additionally touted as a fun crafting idea for families to work on together, so you don’t have to consider yourself an artist to still have creative fun. Or, one could simply walk into the store to buy a gift for a youngster, and end up with a head full of ideas and a doll or 2 of their own to play with. Such is the story of newcomer Munny artist Tanya Davis who now has her first TRIKKY doll creation on display at a local gallery. A couple of photos of this piece are being shared with her permission here. 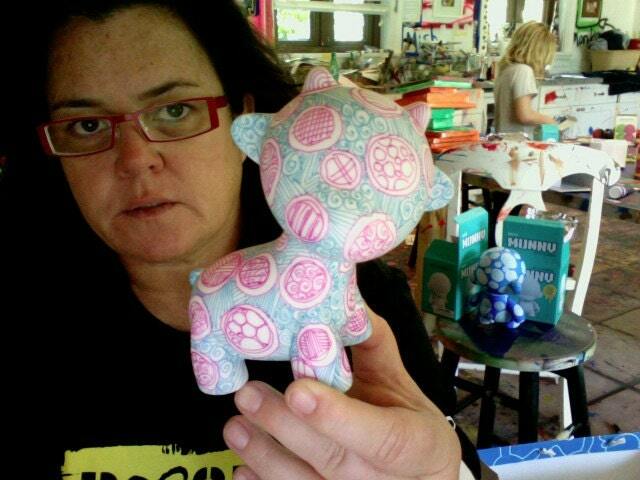 A celebrity who is mad for the Munny is Rosie O’Donnell. She often mentions them in interviews as she did on The Martha Stewart Show, and even sells them from her etsy store in order to benefit her arts education school for children. The Munny’s base form is made of a smooth white vinyl - sort of a blank canvass - that is safe to bake at 275F if applying polymer clays. Aside from paint, ink, and clay, there are many things you can do such as glue decoration to them, apply typographics, use yarn and fabric – you imagine it, you can make it happen to the Munny. It is also common for art teachers to assign Munny customization projects for their classes. They range in size from the "micro" at 2.5in and go up to the 18in “mega”. The figurine shapes vary, with their own names, there is the original MUNNY and also BUB, TRIKKY, RAFFY, FOOMI and ROOZ. New releases come out every so often, and there are limited editions of unique doll forms and even a variety of premade vinyl accessories to go with them. Here is a video I found that shows the artistic process of one painter working on a Munny project with a short stop-animation story at the end. Thank you for reading and commenting on my article, E. I am glad you enjoyed it. These big-headed dolls are really amazing in their artistic potential. This video was really well done, and I thought it was a great note to end the Munny intro on. This is obviously a subject Tanya and I are both very enthusiastic about. The data you have providing is very useful at all be grateful for sharing valuable information with us.